Let's say you are preparing a report, and you want to count how many sales invoices were greater or lesser than a particular value. Use the COUNTIF function to count numbers greater than or less than a number. 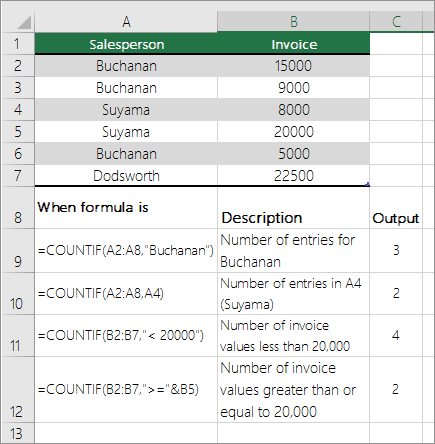 A11 and A12 has formulas where COUNTIF checks for the number of invoices less than 20000 and greater than or equal to 20,000 in the B2:B7 range. COUNTIF finds 4 values less than 20000 and 2 values greater than and equal to 20000.